Perfect for wet weather conditions, this women's Wellington Boot has been at the heart of the Hunter Original brand since its introduction in 1956. Formed of natural rubber, each pair is made from 28 hand-cut parts and assembled over three days on an aluminium last bespoke to Hunter, before being vulcanised for superior protection. 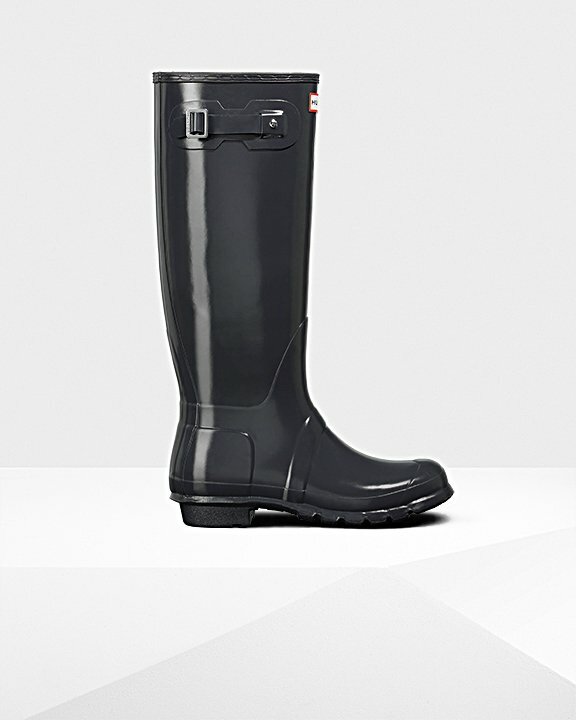 Featuring the Hunter Original tread pattern, and a comfortable polyester lining, the Original Tall Gloss Wellington in slate gray is a timeless wet weather staple. Rated 4 out of 5 by Karen from Stunning Red Gloss I love the colour of the boot, I purchased red gloss tall wellington in size 5. I am however, struggling to remove the boot after use. It is so tight around my calf. I did try a size 6 but then the foot area appeared too big. I am hoping, that in time the boot will give a little around the calf area. Rated 3 out of 5 by Sheila from Great looking boots, I hope they last .... I love my Hunters, especially in the bright pink. The delivery was quick and they look great. I feel unable to give a 5 rating yet as I’m waiting to find out if they’ll split the same as the other Hunter boots I’ve had in the past. I would love to review again in 6 months and give a 5 rating. Rated 5 out of 5 by Gemma from Love them!!!! Love them! Mine are in pink, but it’s quite a vibrant pink, which is more sort of fluorescent pink compared to the picture. Comfortable to wear and the fit is nice. I would say if you have larger calves etc you might find they are a bit snug fit. I’m quite slim so they fit ok. Rated 4 out of 5 by Katie from Not designed for larger legs Lovely wellies, but not made for people with muscular legs like myself. A little bit of scrunching at the front as a result. Despite this they're still really gorgeous and comfy, so I've kept them! Rated 1 out of 5 by Vicky_lou from Disappointing Fit Very disappointing fit on these Wellington boots. They are the same as I have had previously, and I ordered the same size as I have currently, and found them impossible to get off my feet whilst only wearing leggings and no thick socks. I therefore ordered the next size up (to my surprise a I have never had to do this), and again had the same issue. Rather than keep going backwards and forwards with orders, I have returned the Wellington boots for a refund. Disappointing from a reputable company such as Hunter. Rated 5 out of 5 by SJH1 from Major husband brownie points!! My wife loves her boots! She would live in them if she could!